Turns out Star Convoy was only half of the equation. It appears that the Generations Selects line is now officially a shared initiative between Hasbro and Takara Tomy with Selects Smokescreen now available for pre-order on Takara Tomy Mall as a limited exclusive for Japan. The price is higher than the Hasbro version at the tax inclusive price of 4,104 JPY (currently $36.64) and listed as a September release despite Hasbro's being scheduled for October. What this could mean for Japanese releases of previous Selects figures Combat Megatron, Ricochet, and Red Swoop is yet to be seen. 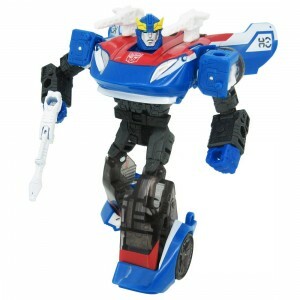 TTM also added a third picture of Smokescreen. Soooo... when we put out a Selects toy in the US, it's for retail price and Takara puts it up on the Mall for about that price. When Japan does it, it's super expensive, apparently because it's a Takara Tomy Mall exclusive. That be some BS, mate. Lore Keeper wrote: Soooo... when we put out a Selects toy in the US, it's for retail price and Takara puts it up on the Mall for about that price. When Japan does it, it's super expensive, apparently because it's a Takara Tomy Mall exclusive. That be some BS, mate. Takara's been doing it for forever. Everyone just said that it was the cost for a premium paint job, but they kept doing it after brand unification. So they're using the actual toys for photos now? Color me surprised. So that means the number on left door is indeed inverted on the figure itself. Well, maybe and maybe not. That's definitely a nearly finished sample they've photographed. That doesn't mean we won't see some last minute changes, though, and here's why. Hasbro Pulse has the item on "Preorder" until mid May. Why would they cap the preorders like that when they don't really do that for other items? Because, Smokescreen is probably being made to order. They're going to produce however many are needed to fill the preorders submitted by mid May and then a little extra to cover any post release interest and customer service replacements. There's potentially time, if this is the case, to correct that error on the tampographing. This can also explain why Takara Tomy can release this in September while Hasbro is having us wait until October. Japan will be the first to get these when they are finished in the factory, as they are closest to the factories is Vietnam. then North America will have to wait until they get their shipments via boat. So they put product codes on the samples too? Interesting. JelZe GoldRabbit wrote: So they put product codes on the samples too? Interesting. Maybe? I don't know for sure, but the factory has to put through a few samples of what the final product will be for Hasbro and Takara Tomy to approve for mass production so that their aren't big flaws that make it to retail. (Obviously, mistakes still get through from time to time.) The product code might be part of this process, so that Hasbro can see that it's in the right place, etc. This "sample batch" approach was the case frequently with figures put out by the old Transformers Collectors Club. Often, mistakes would crop up with the production versions compared to their advertised versions because they didn't get the initial samples in time to give feedback to the factories before they went into production. Or, sometimes when getting the samples in hand, they made some last minute changes for better aesthetics or functionality or whatever, altering the initial plan advertised. Nemesis Primal wrote: Does that make more sense? It makes sense, but that doesn't necessarily mean it's right. So far we're just bouncing around theories. What we need is more numbered figures or an outright answer from Hasbro on the matter. Fair enough. Theorizing is always fun though, so why not? On the subject of theorizing, I had a thought: do we think the Cybertron Defense Hot Shot that's possibly coming from the Hound mold will be a Selects figure rather than a mainline release? It would make the numbering for both Siege and Selects make a bit more sense. On topic regarding Smokescreen though, I personally think that in terms of this mold, Prowl < Smokescreen < Barricade, but none of the three make me want to get them yet. Hopefully Bluestreak will change that, and then having a version of the mold in-hand will help me formulate a final opinion on Barricade. I do hope Bluestreak's windows/tires are the same smoky color as Smokescreen here, rather than Prowl's clear. Comic reads left to right unlike most Japanese manga. Was it really necessary to start another line? Don't we have enough different lines going at the same time? Generations, Cyberverse, Studio Series, Botbots etc. Was this stupid Selects line really necessary? Couldn't they just release these figures in the regular Generations line? Aimless Misfire wrote: Was it really necessary to start another line? Don't we have enough different lines going at the same time? Generations, Cyberverse, Studio Series, Botbots etc. Was this stupid Selects line really necessary? Couldn't they just release these figures in the regular Generations line? It's just a way to say it's a Generations figure but not one being distributed through traditional retail channels. Just pretend it's "Generations", same as "Transformers Generations: War for Cybertron: Siege" or "Transformers Generations: Combiner Wars" or "Transformers Generations: Thrilling 30" and so on. But a bit confusing to keep track of, for sure. I mean, I don't know how even classify it as it covers both Siege and non-Siege lines, like how Reveal the Shield covered both the Movie and G1. I believe *Selects* mostly will be made up of retools/repaints of whatever Generations line is current, or at least, very recent (PotP & Siege). I would expect next year to start seeing Select Series use of Siege & whatever is next. I doubt that selects will be used for repaints of toys from lines like Cyberverse, SS, Masterpiece etc..., at least I hope not. The only real confusion I see would be with exclusives from other online retailers such as Amazon. I presume last years Amazon exclusives did well in order to warrant more (presumably Greenlight & Lancer..) However it may have been a bit of a stopgap measure to cover the transition of the loss of TRU, and until Hasbro could fully rebrand their online shopping website. While Pulse is not perfect, it is leaps and bounds better than HTS ever was both technically and aesthetically. I just hope they keep housecleaning as old product moves out, and new product comes in. How about just a 'universal retool line'? I don't think the line has any exclusively original molds yet, so I think this is just a way for them to get repaints/retools out that would otherwise have been shot down, or would have bloated new waves and potentially kept them from hitting stores. So basically the Selects line is just the old Universe line. Aimless Misfire wrote: So basically the Selects line is just the old Universe line. That's a good way to look at it. And really, what's wrong with that? I look at Selects as Universe and TFCC's legitimate love child..
5,436 pages were recently viewed by 935 unique visitors. This page was viewed 2 times on Saturday, April 20th 2019 9:31am CDT. © 2019 Seibertron, Inc. DBA Seibertron.com. All Rights Reserved. Established June 2000. Seibertron.com is owned by Ryan Yzquierdo.